It was an average day like any other. The most exciting event thus far was that Katie had been sent home from work due to an extreme case of laryngitis. My good friend Carlos Danger was in town looking to chill out and visit with us for the first time since we found out we were expecting, so lunch plans were a must. Carlos is a bit of an Asian food junkie and was curious about the new (to him) Aroy Thai Cuisine at the corner of Government and Common. If there’s one thing you can count on Carlos for, it’s a good laugh when friends are together. If there’s a second thing, it’s that he’ll be 10 minutes late. Every time. I like that kind of dependability, and it gave Katie and me the chance to find a seat, order appetizers and brush up on her rudimentary sign language. We began with crispy tofu ($4). Little triangles of good quality tofu were fried and served with a thin sauce favoring garlic and slightly bitter. If you’re not normally a fan of tofu, maybe give this a try. About the time Carlos walked in we were treated to a couple of orders of summer rolls ($6.95). These come in pairs, and at this price you get the shrimp model. 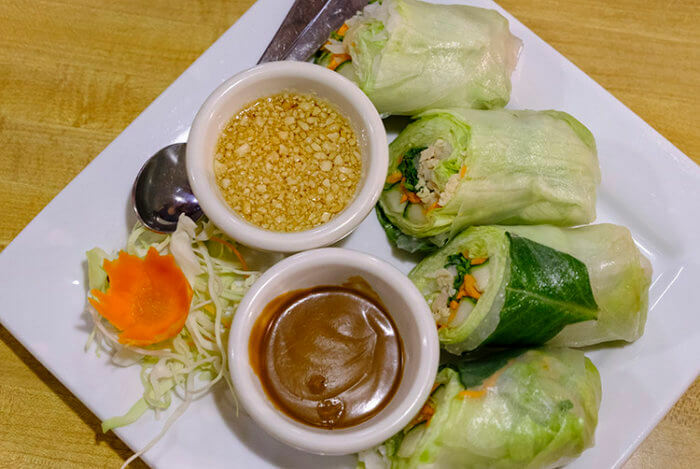 If summer rolls are on the menu, I bite. Always. Cold and fresh, these rice paper wraps were filled with rice noodles (that seemed a little thicker than most) and the usual lettuce, carrot and cucumber. The peanut-hoisin dipping sauce was what you’d expect. Through a sweet dance of pointing and squeaking, poor Katie managed to convey to our waitress that she wanted tom kah. It seems the waitress was looking out for us and mentioned that if she gets the lunch special ($8.95) it comes with a vegetable spring roll and choice of soup. She politely brought Katie her Tom Ka ahead of schedule to aid in the soothing of an obviously aching throat. Katie has since made a full recovery and reported the soup was fairly light with no overpowering flavors, on the brothy side with some mushrooms and little to no chicken. Nothing offensive about it, it may not be the dish you order if you want a big bowl of tom ka as your meal, at least not this lunch version. The included veggie spring rolls were good, with a small, perfectly measured tub of sweet dipping sauce, but the yellow curry with chicken she ordered was really good. With yellow and red curry powder, this dish took on the flavors with a good amount of heat and the right amount of coconut milk. The carrots were like crinkle-cut French fries and there was enough chicken and onions in every bite of the well-cooked jasmine rice. This is great for me because, despite her condition, she eats like a bird and curry is, in my opinion, the best leftover Asian food. Carlos has yet to grasp the concept of trying something different when we are reviewing lunch. He’s a sweet kid, but he gets tunnel vision once the menu is open. “I’ll have curry,” he said. The same soup, the same spring roll, the same presentation, but Mr. Danger chose red curry with shrimp. With red curry, there are more vegetables. Bell peppers, bamboo shoots, eggplant, green beans and basil leaves are the norm, but our friend had them hold the eggplant. I guess eggplant is a little too dangerous. A good amount of shrimp matched the powerful flavor. The only peep we heard from the little fella was him suggesting the curry wasn’t as hot as he personally would have liked, but he understands you can’t go overboard when feeding the masses. With a name like his, it’s probably a good thing they don’t match his heat expectations, although I’d be game. Maybe next time he will ask if they can fire it up. Even though it was lunch, I was searching for the dish that best represents what Aroy is going for. From what I can tell it’s the Pineapple Express ($14.95). This seemed to be a popular dish during my previous visit so I figured I’d go for it. 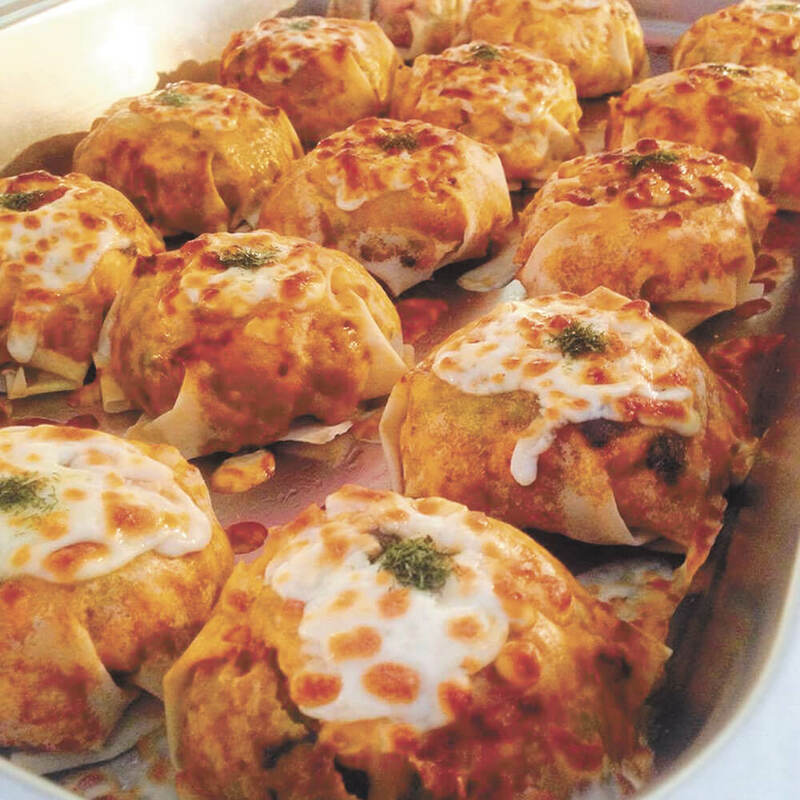 A half pineapple is hollowed out and filled with fried rice, eggs, chunks of pineapple, cashews, peas, carrots, curry powder, chicken and shrimp. I know, I know, I sort of had curry in a pineapple without coconut milk, but mine was very different. This is a lot of food. I can say it’s good enough that I’d consider ordering it again, but more than likely I’ll be more adventurous should I return. I think of Aroy as a solid, consistent place where you’re not likely to get a bad meal. The Oakleigh crowd still sings its praises as a favorite, but there are too many other fantastic Thai spots to compare it to. They’ve been around long enough to have their legs under them and I hope they maintain their momentum. For those within walking distance, it may remain a hotspot. 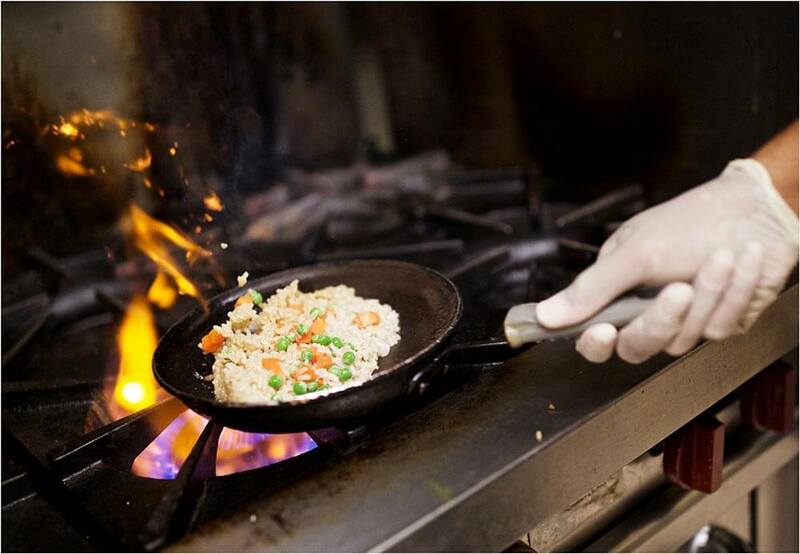 If you’re looking for the best Thai in town you may have to hit Schillinger or St. Elmo. If you’re looking for a quick, decent meal, you’ll find it appropriately situated at the corner of Government and … Common. Chicken Pot Pasta sans gluten … delish!